Elite Orthopedics Technology Consultant Eddie Kampelman demonstrates to a Registered Nurse First Assistant how the Arthrex® ACL TightRope® fixation system works in Elite Orthopedics’ new laboratory. Growth of the agency necessitated that Elite Orthopedics move from rented space in Maplewood, Mo., to a 20,000-square-foot building in Chesterfield, Mo. Elite Orthopedics has moved into a new, 20,000-square-foot space in Chesterfield, Mo., to accommodate the growth the agency has seen since it was founded in 2015. The new facility expands Elite Orthopedics’ classroom space, enabling them to educate up to 70 health care professionals, and gives them a 12-station cadaver lab. It also expands the agency’s warehouse space, enabling them to increase their inventory to better service customers in times of need. “It’s been amazing. The team grew so fast. We had 30 people working for us in 2015 and now we’re at 57. This new space allows us to have larger courses and larger team meetings." Elite Orthopedics didn’t only expand its operations, they expanded their events, including adding a weeknight Synergy MSK™ wireless ultrasound event for health care professionals. The three-hour classes allow Elite Orthopedics to show the surgeons the benefits and portability of the MSK wireless ultrasound while giving them the opportunity to use the product to ultrasound and for needle-guided injections. “Once they get it in their hands and they see how easy it is to use and the quality of images it produces, they want it,” he said of his customers. Want to attend an Elite course and get hands-on training with the latest Arthrex innovations? Contact us today. Story published via eConnect North America February 2018. When surgeons, agency partners and visitors tour Arthrex Inc., they can now experience our prototype machining processes and a new IMAX®-inspired cinema directly on-site at Arthrex’s state-of-the-art, 4,750-square-foot Rapid Prototyping Facility. When guests enter the space with its operating room-quality lighting and its crisp, white epoxy floor, they’ll see the latest electrical discharge machining (EDM) technology and CNC mills, Swiss lathe and coordinate measuring machines (CMM) available for creating prototypes for all product development purposes. Any prototype, from drivers, handles, screws, blades and multi-part instrument components to single sample parts like bone plates and bone screws, can be made here. In addition, the Suture Prototype team is assembling and braiding sample sutures in the same space. The move allowed for upgrades in 3D printing technology with the addition of a new micro XL 3D printer. Having the latest 3D printers has greatly reduced the time for printing plastic prototype parts. In some cases, what used to take 10 hours can now be done in an hour. To date, the Rapid Prototyping team has already completed 290 total prototype development project requests (33 machined and 257 on the 3D printers). That’s 1,119 total prototype parts developed in less than a month! “Anything we can do to reduce the time to make a prototype and get it into the product engineers', product managers' and surgeons’ hands faster, that’s our goal,” said Phil. The idea for Arthrex’s Rapid Prototyping Facility had been a dream of President and Founder Reinhold Schmieding ever since manufacturing operations moved to AMI East from the AMI North building. Last spring, he challenged Manager of Construction & Space Planning Trent Lewis and team to build out the space just in time for last month’s Orthopedic Technology and Innovation Forum, our premier Medical Education event. 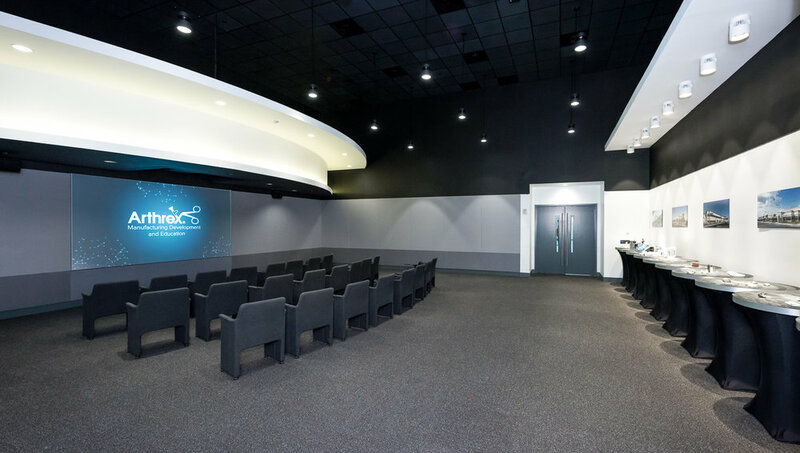 In addition to the Rapid Prototyping Facility, a new 24-seat cinema has also been unveiled to agency and surgeon visitors. The cinema provides a virtual tour of our manufacturing facilities and future expansion plans, loops through various educational videos featuring patient stories and how products are made, and provides additional meeting space. By March, the cinema will be completely outfitted with custom, tiered theater seating, automated LED lighting and a standing row to accommodate 15 additional guests. Arthrex will host its first Surgical Outcomes System™ (SOS™) Global Registry Educational Forums in March at Arthrex’s Global Headquarters in Naples, Florida. The Surgical Outcomes System (SOS), the first global registry in orthopedics, allows orthopedic surgeons and facilities to collect patient-reported outcome measures to earn MIPS points that may contribute to the 2018 Quality Payment Plan or bundled payment plans. SOS includes seven risk-adjusted, CMS-approved sports medicine patient-reported outcome quality measures. SOS Educational Forums will allow physicians, administrators or staff to learn about the value of collecting patient-reported outcomes for quality assurance, reimbursement, marketing, comparative effectiveness and creating actionable data. Attendees will hear from the SOS team and special presenters, including surgeons as well as current and former administrators. The first forums are planned on Tuesday, March 13, and Friday, March 23, following the Health Care Administrator Forums. For more information, contact SOS Manager Morgan Rouleau at Morgan.Rouleau@Arthrex.com. Jimmy Dascani is now an Arthrex employee, but once upon a time, he was a customer. It has given him a unique perspective since joining the company six months ago as Arthrex’s Director of Health Care Administrator Relations. Bringing his extensive health care and business background with him, Jimmy’s new role will help Arthrex develop health care administrator relationships around the country – with your help. We asked Jimmy some questions about this new initiative he is embarking on, including the creation of Arthrex’s Health Care Leadership Forums. The next forum will be held on Wednesday, January 24. I have more than 23 years of experience in the health care and business, working on both clinical leadership roles and sales. Most recently, I have served as the Chief Executive Officer and Chief Nursing Officer for a local hospital. I previously worked for two publicly-traded health care systems, a private hospital system and the VA Healthcare System. How did you come to work at Arthrex? As the former CEO of Landmark Hospital in Naples, Florida, I met with Reinhold (Schmieding), (Global Arthroplasty Business Development Director) Steve Schewe, (Medical Education Director) Dr. Chris Adams, and the Synergy team. I then made the quick decision to align with Arthrex and become an “all-in” customer by investing in the Synergy ecosystem and the power of the overall Arthrex relationship. As I was searching for my next career adventure, the opportunity to work for Arthrex and develop a special program to focus on health care leaders like myself became available. I saw this as an opportunity to use my unique perspective to develop administrative-level relationships around the country and to add a new dynamic to Arthrex’s core strategy. Tell me about how the Health Care Leadership Forum came to be? As you know, education is at the heart of what we do at Arthrex, and Reinhold’s vision for the program included the development of this forum to create a unique and impactful educational experience for anyone in a leadership role in hospitals, health systems and ambulatory surgery centers. You are starting this new initiative from the ground up. What are you excited about? I am excited about a handful of current success stories, and I am excited about all of the future success stories and impact we will make together as the program gains momentum. Administrators will go back to their facilities with a new understanding of us and look to us as the trusted partner of choice to help execute their organizational strategy. I am also excited to help administrators improve patient care through a more in-depth understanding of the value Arthrex delivers. What are your challenges? How are you going to meet those challenges? Creating awareness of the program and driving attendance are challenges that we face today, but through our corporate communications strategy and the creation of new marketing assets, we will overcome those. As we learn from attendees, we will make adjustments and the program will constantly evolve to stay relevant and impactful. Why do you think it is valuable to Arthrex as we move forward as a company? Health Care Administrator Relations is critical to our growth strategy for several reasons. First, there are about 10 administrators for every one practicing physician. In fact, a recent study revealed that from 1975-2010, the number of practicing physicians grew by 150 percent; however, over that same 35 year period, the number of administrators grew by a whopping 3,200 percent. So, the explosion of people in manager to executive-level roles provides us with a huge opportunity to build relationships and develop additional Arthrex champions. Also, the combination of the rise of value analysis teams and the slight erosion of physician decision-making authority has created the opportunity for us to focus on relationships with nursing leaders, operational leaders, supply chain leaders and other influential members of the health care team. Secondly, as hospitals, health systems, and ASC’s struggle to balance costs, utilization, quality and the overall patient experience, they will need to align with organizations across the continuum of care that can help them solve these challenges. They are seeking an innovative and trusted partner like Arthrex to deliver technologies and procedures that drive efficiency and close gaps in their care delivery. Our surgeons understand the value of our Technology Specialists and Consultants, and the value of our products, procedures and technologies, so we just need to make the rest of the health care team aware in ways that are relevant to them. What do you hope the health care leaders who attend get out of this experience? We want to make sure they learn something new that they can take back to their facilities that will improve patient care or create a better experience for their staff and surgeons. We have already seen this happen after our first leadership forum. One group of OR directors went back to their facility with a sense of enthusiasm to become more aligned with Arthrex and invited our agency partner in to meet with physicians and other leaders to introduce new products – just a few days after the forum. Another example of impact is a director from the Value Analysis team at the University of Miami who was so impressed that she has invited us in to meet with additional members of her leadership team. It is our hope that we make a powerful connection with them while they are here, and that they go back to their facility as a champion of Arthrex. How can agencies help with the Health Care Administrator Relations program? We need our agency partners to embrace this program as an important part of their growth strategy and use this program to engage leaders. Extending an invitation for a site visit or to attend a leadership forum is very impactful and powerful in building the relationship. Once administrators understand all of the value differentiators, they will gain a better understanding of why their surgeons and patients prefer Arthrex. I encourage everyone to promote the program and make your surgeons aware so that they can invite administrators or join them during their visit. Please contact me to discuss the program and develop a winning strategy in your area. You can contact me by phone at (239) 216-7083, or email at Jimmy.Dascani@Arthrex.com. Story published via eConnect North America January 2018.